Welcome to my review of the third and final day of I4GG! Cece opened today’s session to discuss the recent rise of genetic genealogy being used to solve criminal cases; this was a major theme of this weekend, not least because a number of law enforcement officers were also in attendance at the conference today. Coincidentally, the day that the arrest of the Golden State Killer was announced was also ‘DNA Day’. Initially, the Barbara Rae-Venter genealogist who had found the killer had stayed anonymous, but chose to identify herself, and it was after the Golden State Killer case that CeCe started working on criminal cases with Parabon. Initially she said she had misgivings, because she had encouraged people to upload their DNA to Gedmatch to use its services, not knowing what it would be used for. However, she said after she saw that the reception to using DNA in this way was mainly positive, she felt more comfortable ethically, but it was important to her that she was open about the work she was doing. CeCe went into a lot of detail about some of the misconceptions surrounding investigative work, and her work with Parabon, plus some insight for those considering this type of work. I’m actually not going to go into more detail about her thoughts on this now, because I would like to do a blog post about investigative work in general. I’ve also had conversations with other genetic genealogists who are uncomfortable with genetic genealogy and Gedmatch being used in this way, so I think a fuller article is more appropriate. For not, let’s just say that I thought CeCe’s talk on this subject was well balanced, taking account of differing views, and she was careful to state why it was important to her to do this kind of work, and what anyone considering it should be aware of. Diahan said that every single one of our DNA matches has a known relationship to one of our questions, and can help us answer them. When you work with DNA matches, she suggested that you want to look for the best matches to help you answer that question. Admittedly, working that out, isn’t always the easiest thing in the world, particularly if you have endogamous lines. In my case I’ve managed to answer some of my questions, but even where I haven’t, I’ve been able to segment my matches so that I can start to be able to get answers. To try and lay this out in practice, here’s an example. To try and identify my 2x great-grandfather (to answer the above ‘who was my dad’s paternal grandmother’s (Jane) father’ question), who would be the best match to help me answer that question? To answer that, I would want to test known relatives to my great-grandmother, Louisa. Great, my dad had already tested, and I had access to his results. However, Louisa married about seven years after the birth of my grandfather Jack, and had several more children. If I wanted to trace any ancestors on this side of my tree, I could follow the birth, marriage and death records to identify Jack’s half-siblings and their offspring; unless those offspring happened to also be related to my dad in some other way, I would know that any shared DNA matches should be on this line, and may potentially uncover the identity of my 2x great-grandfather. The idea is you are trying to identify someone with a known relationship to someone where the mystery is, and then you use that person as an anchor point to then work with your shared matches. In the case of my dad’s tree this is crucial, since probably 95% of his matches on Ancestry are related to him through his American great-grandfather, purely because AncestryDNA has been going in the US a lot longer than anywhere else, and has a bigger take up than anywhere else. Diahan also pointed out that statistically, you don’t necessarily inherit a lot of DNA from a particular ancestor, particularly as the generations go back, so sometimes it’s worth looking at who else shares DNA with a particular match of yours that you don’t share DNA with. If you have any DNA Circles on Ancestry you can see an example of this; for example, I have a couple of DNA circles where I don’t share any DNA with a particular person, but we both descend from a particular ancestor, and that DNA circle person shares DNA with one of my matches, just not with me. Diahan also gave us some tips on working out the most likely with a DNA match; although not infallible, if you can identify the approximate age or generational distance from you, you can narrow down the range of possible relationships with a match. Your first port of call should always be the Shared CM Calculator to narrow down the range of relationships, but from there, you might be able to narrow this down a bit further. For example, if Ancestry is telling you that someone is likely your second cousin, but that match is considerably older than you, then it’s more likely that that person is a first cousin once removed. I was really excited for this session; you may not know this about me, but I am a HUGE spreadsheet nerd. My day job before starting Toll Genealogy was as a project manager, and I used to spend a lot of my working day writing and designing very fancy Excel reports. As soon as I came across the Leeds method on the internet I dabbled with it, but I was investigating ways to be able to use the Leeds method in conjunction with some of my reporting techniques. I am not going to go into too much detail about Dana’s lecture, because I think it’s best to learn from her. If you haven’t ever heard of the Leeds Method before, do check out Dana’s website and posts here: https://www.danaleeds.com/leeds-method-dna/. 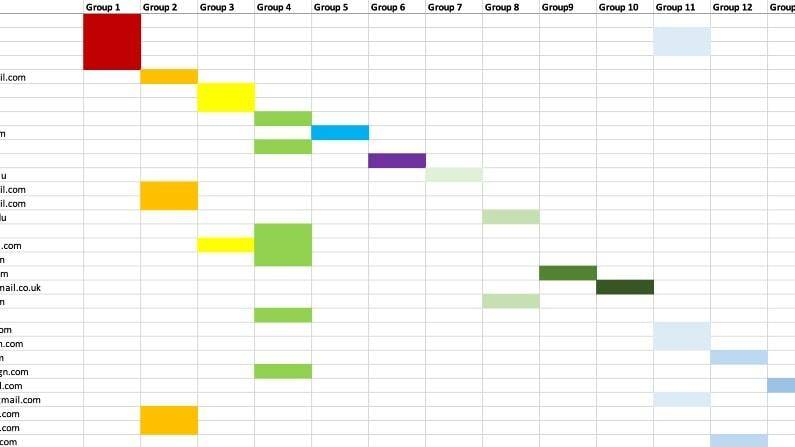 But for a brief overview, the Leeds method is basically a way to try and cluster your DNA matches, originally with the aim of clustering your matches into your four grandparent lines. For some people it works brilliantly; if you have endogamous lines, or just not very many matches in the first place (that would be most British people), it doesn’t always help. I know some of the cases I work on it’s ended up with one big column of one colour (oh hello, endogamy! ), and others where I’ve ended up with 35-40 different and sparse colour columns. After a great lunch, I attended Kathy Johnston’s talk about X-DNA. I freely admit that I was not very knowledgeable about X-DNA before Kathy’s talk, and it was not something I felt was very useful. I mean, I knew what it was, but as far as I was concerned all my X matches were really distant, we probably shared an ancestor way, way, way back, and I’d never be able to work out a relationship from X-DNA alone. Now, in my case that may be true, at least right now, I don’t really have workable X-DNA matches right now, at least on 23andMe, Gedmatch and FamilyTreeDNA (Ancestry doesn’t provide any X-DNA information, nor does My Heritage (right now; I understand this is something they are planning to add in the future, at least according to this post). With Gedmatch you can run just the X-DNA match test, with 23andMe and FamilyTreeDNA, I believe you have to match on an autosomal test to be able to see where you match with someone on the X (and you and your match have to have both opted into the chromosome browser functionality). Kathy showed us how she uses X chromosome descendancy charts for a person to work out who an X could have come from. For the best example I’ve found (which Kathy also used), check out Blaine Bettinger’s blog post on this subject at https://thegeneticgenealogist.com/2008/12/21/unlocking-the-genealogical-secrets-of-the-x-chromosome/ . You’ll see there are two one for males and one for females; since the pattern of descendancy will work differently depending on whether you or your subject is male or female. You can use these or similar charts in another way that Kathy outlined; you can flip them upside down, and put an ancestor at the top. This is particularly useful where you know how you match with a particular DNA match that you also share X DNA with, but not where that X DNA comes from. 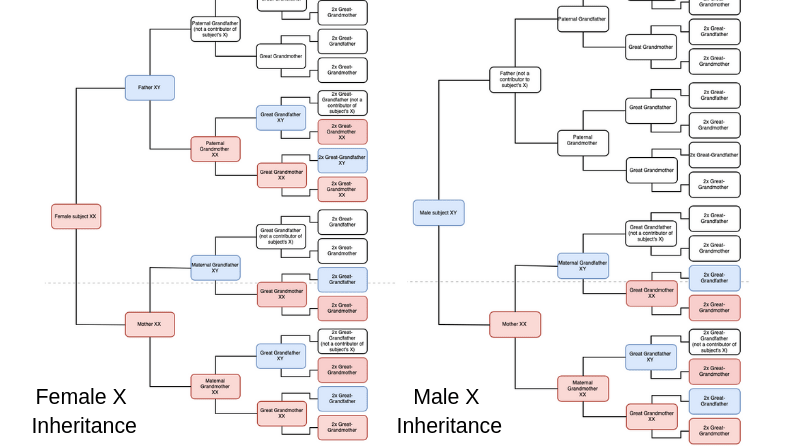 You’d put your common ancestor at the top, then on each side of the chart, build the tree down so you can see visually which descendants would have carried that X down to you and your match. Kathy also stated that in 14% of cases, the X-DNA is passed down completely intact from mother to child. I found Kathy’s talk really informative, and as I work with Gedmatch on forensic and unknown parentage cases, it’s helped me understand how and when I really need to pay close attention to that X. I’m also looking forward to being able to use it with my own tree as I get more and more matches through, as more British people start to test. It was wonderful to hear from Barbara-Rae who basically told us a little bit about her work and how she got involved in investigative genealogy. 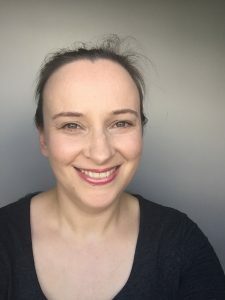 Barbara-Rae started, like many of us, as a genealogist working on her own family history, and got involved with genetic genealogy in trying to uncover a branch of her Scottish roots through the creation of a DNA Project using Family Tree DNA. She started volunteering as a search angel through DNAAdoption.com. At some point, a detective with the San Bernardino County Sheriff’s Department contacting DNAAdoption.com to see if genetic genealogy techniques might be able to be used to uncover the identity of a kidnap victim, Lisa Jensen. This was a story I was familiar with, having read about it in a Boston Globe piece. Lisa was essentially abandoned by her ‘father’ at the age of about five years old, and given, by him, to a couple for a trial adoption. When this couple tried to make the adoption official, they found the father had disappeared. As time went on, it became painfully clear that Lisa had been abused and had led a very traumatic early life. The police later traced the man who had abandoned Lisa, and DNA testing later proved he was not her father. Through DNA testing of Lisa, and genetic genealogy research techniques Barbara was able to identify Lisa’s mother, whose name had been Denise, and the fact that she and her baby had been missing since November 1981. Barbara also talked about how the man who had abandoned Lisa, was tied to the Bear Brooks Murders, and one of the victims, a young girl, was proved to be his daughter. Barbara spoke about how a suspect for the Golden State Killer case was narrowed down, and a brief recap of the history of the Golden State Killer linked crimes (great for those of us not from California, with no real knowledge of what had happened). For more information about how she worked on that case, this New York Times article is excellent. You can also watch her talk to the Genetic Genealogy Ireland conference on Youtube here. The sense I got from listening to Barbara, and also from hearing CeCe talk, is that although the issue of forensic/investigative genetic genealogy is one that has sharply divided the genetic genealogy community, is that they both do it because they feel it’s really important work. As I mentioned earlier, I’m planning a blog post (or perhaps more than one!) on this subject, because I feel it’s one that’s incredibly important, and it’s also an issue that is difficult to understand, both on the sides for and against. There are a lot of misconceptions about genetic genealogy and its use by law enforcement, and frankly, no argument I’ve read, for or against fits every single nuance. Finally, on a more light-hearted note CeCe closed the conference by treating us to some behind-the-scenes stories from Finding Your Roots, and explaining how some of the more memorable cases were researched, including that of Tea Leone. We also got to see the trailer for, and an idea of the celebrities that would be featured on the new season. All of this is now old news, of course, since the show started its new season on 8th January in the US! I adore Finding Your Roots, and I’m so sad that it’s not shown here in the UK. However you can watch the first two seasons via the PBS UK channel (seven day free trial available – you can binge watch both series in that time!) on Amazon Prime, or by buying it from iTunes. I am so glad that I made the decision to go to the conference and to go to San Diego. I learned so much, met some really great people, and yes, it was great to be in such a beautiful and warm city in December! I would definitely go again if it runs in future (and if I could afford it, I would probably go to Southern California in December every year just to be in the warm!). It was so inspiring to be in the company of other people interested in and knowledgeable about genetic genealogy. I also learned that if you are the only British person in the room, you will get asked weird and wonderful questions about British genealogy and record sets, and nine times out of 10 you will actually know the answer! I really wish that I had planned to stay an extra couple of days so that I could sight-see more; I didn’t really ‘see’ San Diego beyond the neighbourhood of the hotel. That said, staying at the hotel where the conference was held was a wise move, and made things so much easier. All in all, I would 100% recommend anyone to go to the conference!